I have seen many users using Windows Media player. It’s not only a popular one but also good music player. But, to be honest I don’t like it that much. I prefer other players like iTunes and VLC. Well, if you’re a Windows Media Player user and you came across errors while using it, you may consider uninstalling it. 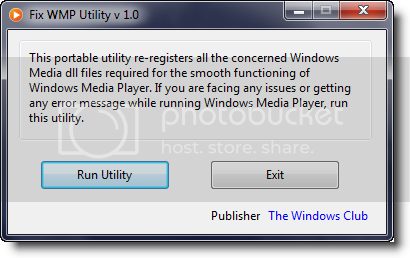 But, before doing so, try out a small utility known as WMP fix utility that allows you to fix the Windows Media Player. It’s a small utility developed by the Windows Club. It can re-register over 40 dll files required for the smooth functioning of WMP. The tool works perfectly on WMP 12 and versions prior to it.